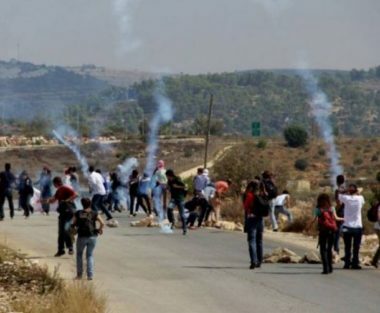 Israeli soldiers attacked, Friday, the weekly nonviolent procession against the Annexation Wall and colonies, in Ni’lin village, west of the central West Bank city of Ramallah, causing many Palestinians to suffer the effects of teargas inhalation. The soldiers attacked many locals, and international peace activists, marching against the illegal Annexation Wall and colonies, after gathering in the center of the village and heading towards the villager’s isolated orchards. Today’s procession also marks the 101st anniversary of the Balfour Declaration, in which Britain promised the Zionist movement a Jewish homeland in Palestine.